This is Part 1 of a 5 part series about chatbots and UX. I’ve been reading about chatbots since the beginning of the year and have been building for the past several months. In that time I’ve built, or helped build, 5 bots and have connected with other teams building around the world to trade insights. I’ve also been blessed to be surrounded by the world class talent that builds for R/GA, along with the incredible minds at Google. There’s no doubt the group of creators I’m surrounded with every day has helped immensely. But no matter how many smart people I talk to or how much reading I do, there’s nothing that can supplement building, testing, failing, and iterating until the problem is solved. I hope this series will help accelerate your process, but at the end of the day I really hope it helps you get to building. And if you have questions, please feel free to reach out! That’s a loaded sentence. What does it mean? Let’s break it down. There are plenty of tools out there that allow us to communicate one-to-many at this point in history. These tools, including everything from basic mailers to email marketing to social media platforms, make it easy to reach a large audience and target groups all at the same. But, for the most part, these tools do not allow us to communicate with people on an individual level. Many of these tools have become ubiquitous to the point that they’ve become white noise in our life. They’re embedded with what most people will tell you are ‘spammy’ marketing messages. They don’t often bring meaningful value anymore and usually frustrate people more than anything. We don’t really interact with these messages, we generally trash them. One-to-many communication tools are still an option, but they’re becoming obsolete more and more every day. Reaching mass amounts of people at the individual level is something that hasn’t been around for very long. The most popular way to do so right now is through cookies or programmatic advertising but, ultimately, reaching the individual in a meaningful way takes a lot of work and analytic knowhow if you want to do it right. The benefit of individual communication tools is that the value of the message is much greater. The message people receive isn’t a blanket message put to blast out to millions of people, regardless of who they are. The message is more specific and, while it may still end up reaching millions, it feels much more like the message was made for the recipient. The downfall of these tools is that they typically come in the form of a banner ad or email that was sent based on a site the user had visited or an item the user had recently viewed/purchased. This sounds great to a business, but it sounds (and feels) creepy to the person receiving the message. We do this every day when we talk to someone. It’s unconscious behavior for most people. I believe contextual communication (a form of dynamic intelligence) is what will make chatbots the revolutionary technology everyone is promising. What contextual communication will allow us to do is create messaging and interactions similar to what people experience through individual communication channels like programmatic advertising. However, instead of a message blast sent based on analytics, the communication will occur in the context of a conversation. By doing this in the context of a conversation, it doesn’t feel so weird and creepy to get such a specific message. Right now contextually communicating with bots isn’t something that’s reasonable to ask across the board but there are a fewthataredoingit well, and I believe this type of interaction will be the standard in the future. Aside from the reasoning we just walked through, there’s also the fact that humans are innately wired to have conversations. It’s part of our daily lives, and we rely on our devices to help us communicate every day. We’ve been selling goods, learning new skills, and building relationships through conversation for millenniums. 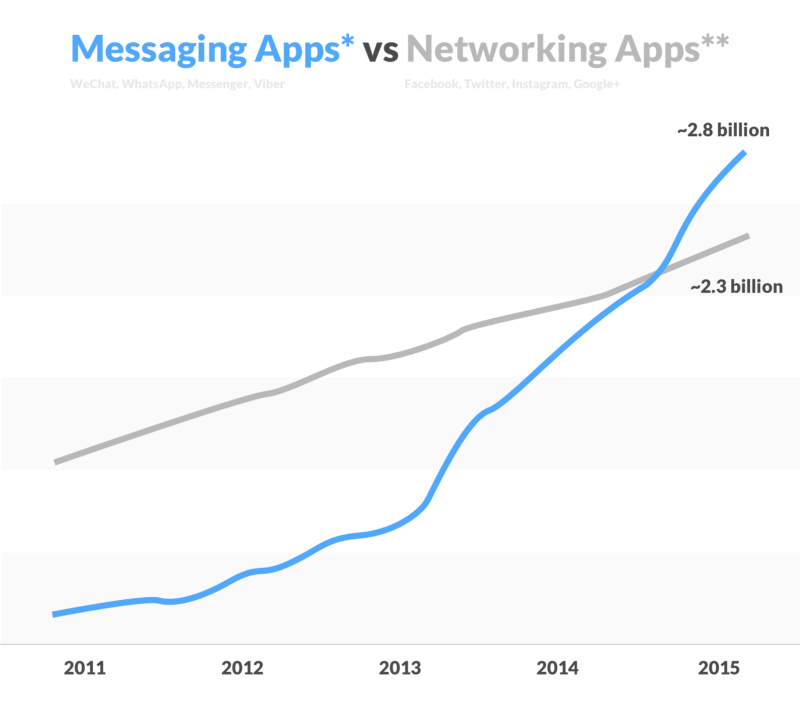 Messaging apps just happen to be the newest and most popular way to do it right now. It’s only natural that we begin to see businesses build where their users are active — messaging platforms — instead of trying to create and onboard users to new ecosystems they’ve created. Not only is it easier and more cost effective, it’s also a more natural form of communication. It’s easier to continue a conversation than it is to start a new one. It’s time to stop wasting money trying to pull people into your ecosystem and instead push your content where your users are already active. Use messaging apps to build relationships with your audience in a way that feels organic and natural. This article was originally published on uxdesign.cc and has been edited for the Envato Blog.